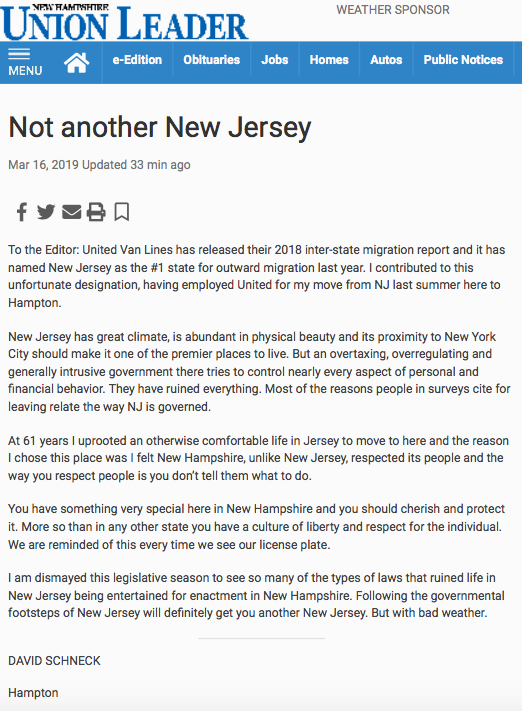 Common Sense For Belmar › On A Path To New Jersey? On A Path To New Jersey? This was written by admin. Posted on Monday, March 18, 2019, at 9:33 am. Filed under Uncategorized. Bookmark the permalink. Follow comments here with the RSS feed. Post a comment or leave a trackback. Their 250 word limit made it difficult to make all the points I wanted to. Wondering how long it was going to take!!! Dave – please don’t ever give up what you are doing. The world needs your common sense. People are too caught up to pay attention to the downside of government intrusion into all aspects of life.